I jump into a taxi. A hairdresser I went to yesterday gave me an awful haircut, and now I can’t fix this puffed up hair by myself. Bah, nothing to do now, in for a penny in for a pound, as they say. After waiting for quite a while in the embassy in Buffalo, it’s finally my turn. The person before me got a visa he wanted, and is jumping around like a madman. I wonder if I will be like that? “Glenn Gould?” murmurs the female immigration officer. In the newspapers she gave me, there is a big photo of Gould. I got completely confused and awfully upset. 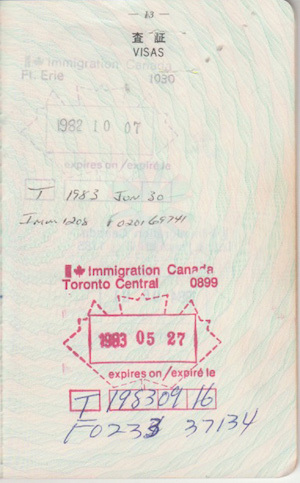 “They wouldn’t give me a seven-day visa at the immigration office in Toronto. When I made a phone call here I was instructed to leave Canada, so I spent a week in the Niagara Falls City in the United States. It seems that my honesty was appreciated. The stern expression on the immigration officer’s face softened. This is how I got my long-coveted student visa. I am walking towards the bus depot (a bus stop) and crying out loud. I can’t wipe my tears because of two bags I am carrying. Horrible, horrible! I am shocked beyond words. Gould is not in Toronto anymore. To a person at the bus stop asking me “Why are you crying so much?” I respond, “A friend of mine died.” I am writing a letter to my family in Japan while waiting for a bus. What is the point of going back to Toronto when Glenn Gould is no longer there? While tears are pouring down my face I am reviving the moments of my life spent with Gould, reviving all the time I spent longing for him. I wrote to the New York office of the Columbia Records and asked if they could give me Gould’s address, adding to the letter exquisite Japanese commemorative postage stamps. The postage stamps I had sent were wrapped in a beautiful paper and placed in an envelope. I thought of the wonderful employee in this faraway country who did such a kind job. favourite book, Thus Spoke Zarathustra, written by Friedrich W. Nietzsche. How will I continue with my life now? The bus entered Canada without difficulties. When I was in Japan, whenever I saw a beautiful scenery, I always thought I wanted to share it with Gould. I believe one year in September I made two small sweet potatoes, and wrote Glenn Gould’s and Masako Hara’s name on each. And then I prayed for the two of them. My mother was appalled. 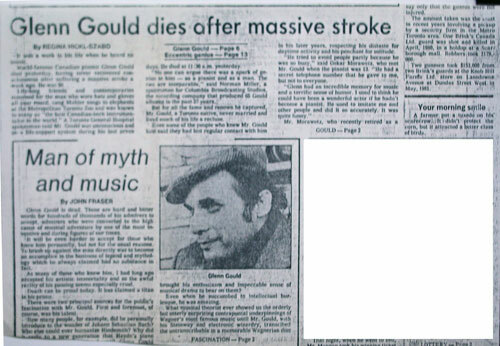 Once I asked my mother who was dying of cancer, “When you pass to the spirit world, please protect me so I can meet Gould.” Oh, if looks could kill, I would be dead right then. Gould was everything in this world for me. I can’t express what an encouragement those concertos that the famous Vladimir Golschmann and Gould performed together were for me. Bach’s Partitas; I loved #5&6 more than Goldberg. During bitter times in my life, with his lively music Gould gave me driving force to go through my days and nights. time, and in which I would receive comfort from a fountain of music influenced by Gould’s ideas at another. I feel as if all those times led to this October 7th, 1982. People who made a legend all ascended to heaven. In my great sorrow, I think of all the days I spent together with Gould’s music. Today Toronto is wrapped in fog. I can barely see 30 meters ahead of me. This unusual atmosphere reminds me again that Gould passed away. When I was changing streetcars I met several of my friends. One look at my face told them clearly I already knew of Gould’s death. They are watching me intently, worry etched on their faces. But, I just can’t force myself to make any conversation with them. I am calling Mr and Mrs Smith from Southwood Dr. They’ve just come back from Gould’s family funeral. 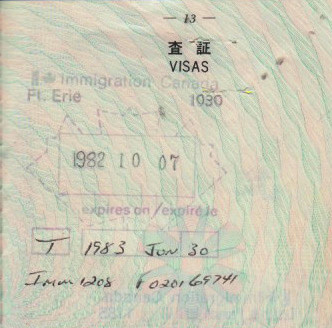 They could not reach me, and they were worried about me not getting Canadian visa and having to go back to Japan from the US without knowing about Gould’s death. They thought it would be a great shock for me if I learned about it in Japan. That night, Gould’s performance of Goldberg’s Variations was broadcasted on TV. It was a sad introduction to his “new recording”. In April and May of 1981 Gould made a film of his performance of Goldberg in cooperation with Bruno Monsaingeon. In June the two of them worked hard on the film editing at Inn On the Park. When he finishes playing, Gould suddenly drops down his head. Then, he lifts his hands and puts them together and prays to the piano like a Buddhist.